RCS & Associates Represents, Daido Coporation of America - Line of Industrial ANSI Standard, Metric, and Specialty Chains. Daido Coporation of America - Line of Industrial ANSI Standard, Metric, and Specialty Chains. World class, state of the art technology and internationally known design and manufacturing of precision roller chain products. 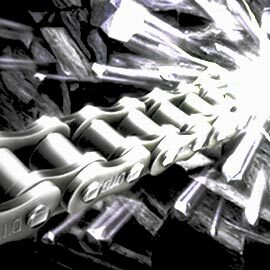 For world class, state of the art technology and internationally known design and manufacturing in precision roller chain products, Daido Corporation offers a comprehensive selection of Standard Drive Chains, revolutionary D.I. D. Tech Chain Series and an assortment of Specialty and Standard Conveyor Chains. Daido Corporation also provides the Murtfeldt Chain Belt Tensioner and Guides for system reliability and pre-tensioning requirements to keep tension correct for extended years of use and stability. Please click any of the product lines and you will be linked to the Daido Corporation of America Website Page. We will also include a link list for you on this page. RCS & Associates makes it easy to find exactly what you're looking for. Enjoy, and let one of our Daido Corporation of America Reps assist you with any questions by visiting our CONTACT-US Page. We are here to help you find the right solution for your application the first time. Daido D.I.D. 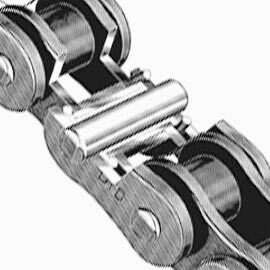 Tech Roller Chains are designed for arduous drive train applications. Let's Get into the new TECH! from Daido! D.I.D Ultimate Life Chain Series are applicable for systems that are exposed to contaminants or lubricant deficiency. 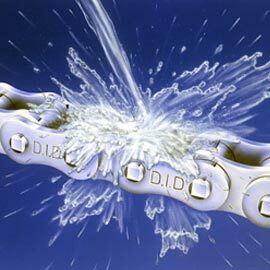 D.I.D Environment Resistant Chains are specifically used in operations exposed to extreme environmental changes. D.I.D Low Noise Chain Series provides for a more worker friendly environment in chain conveyor and drive applications where noise reduction is calming. The KS type Roller Chains are enhanced for shock and fatigue strength and durability by preserving the dimension in the pin length direction of standard roller chains. The Plates are enlarged and provide for improved assembly and machining accuracy of components. The roller chains embrace high transmission efficiency for low to high speed applications and are formidable enough to withstand long-term use. 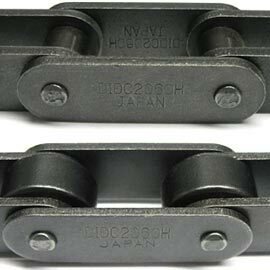 The HK type Roller Chains comply with ANSI for the H type chain. Their inner and outer plates are equal in thickness to those of the next larger size of standard roller chains. Consequently, the tensile strength is greater by approximately 20 percent and the maximum allowable load is higher by about 15 percent compared to D.I.D ANSI standard roller chains. Because of this the weight of the chain is also higher, so high speed performance declines. Therefore the HK type roller chains are more applicable for heavy duty operations at a lower speed. The DID HKS series Roller Chain uses thicker link plates than the KS type roller chain. This provides a higher tensile strength and the maximum load safely permitted in general application chains. 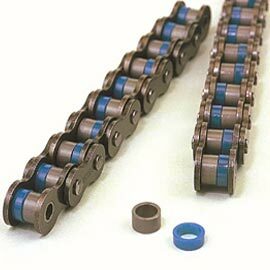 Therefore this roller chain is appropriate for low speed heavy duty transmission. The HKS roller chains are 50 percent higher in maximum allowable load and 20 percent higher in tensile strength than the standard roller chain, but since they also weigh more, high speed performance is lower. This roller chain is suitable for heavy duty applications at low speed. Daido's "T" AND "D" Series Roller Chains are manufactured using a cold forged bushing. They are lubricated with Daido’s patented V-Grease. Daido’s lubricant prolongs the chains wear life up to 4 times longer than traditional ANSI standard roller chains. The patented V-Grease adheres to the chain in extreme revolution applications and resists being washed away in outside usage. Daido's D & T Series chain is one of the lowest cost improvements available for your roller chain requirements. Next to the stainless steel chain, the Hi-Guard Chain is second in corrosion resistance performance. A special baking process produces a luster-less white protective film on the surface of the chain. The Hi-Guard chain has excellent rust and galvanic corrosion resistance. Because the film is heat-resistant up to 482 0F, it protects the chain in extremely high temperatures. This chain has a marginally lower tensile strength than the standard chain, but provides the corresponding equivalency in maximum allowable load and wear resistance. The stainless steel chain is lower in strength and wear resistance, so for this reason, when necessary corrosion resistance is mandatory without sacrificing strength, the Hi-Guard chain is your solution. Since the Hi-Guard film works as a sacrificial bond for the base chain, ample corrosion resistance can be expected even if the film peels. The Double Guard Chain (WE) has D.I.D. 's unique application of two different coatings processed before assembly on the ANSI standard chain. It attains roughly two times more anti-corrosion performance than a Hi-Guard Chain in a salt water spray test. This chain also resists light alkali and tolerates an acidic atmosphere. This is why it is considered the best alternative to the Stainless Steel Chain. The strength is the same as the Hi-Guard Chain. 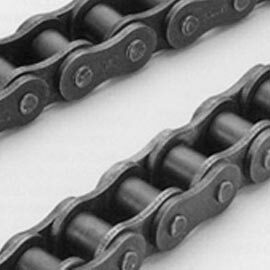 TK chain is unlikely to suffer from low temperature brittleness compared to the standard roller chain which becomes brittle at low temperatures and must be used in temperatures higher than 14°F. The TK chain can survive temperatures as low as 40°F by appropriately calibrating the maximum allowable load. The lubricating oil applied on the chain is a unique low temperature oil. DID Stainless Steel chain is available in two types. The SS chain with all of the components made of austenitic steel (SUS304, 18-8 stainless steel), containing a higher chromium and lower carbon content, minimizes chromium carbide precipitation. It is corrosion and heat resistant and ideal for use in chemical plants, food processing, water treatment machines and more. But note, its tensile strength is less than 70 percent that of a standard roller chain so consider this factor when selecting the chain you need for your application. The SSK chain is provided with bushings, pins and rollers that are made of quench-hardened stainless steel (SUS631) that are cold rolled and precipitation hardened ensuring corrosion resistance. 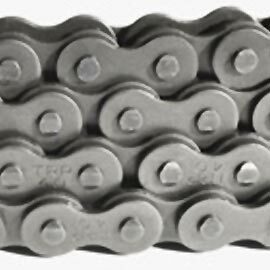 This allows for 1.5 times higher maximum load than the SS chain. Their plates are made of austenitic stainless steel (SUS304). The Stainless Steel X-Ring chain (SSLT) uses a chemical resistant X-Ring that is an FDA/USDA approved lubricant providing for up to 10 times longer wear life. The demand for lower equipment noise in the working environment is growing significantly. The D.I.D. Low Noise Chain meets this demand by providing a silencing effect in various industries such as printing, engineering, parking and various conveyors, packaging and more. A "two piece roller structure" achieves a significant noise reduction effect. Equipped with a special elastomer to achieve the silencing effect, when the chain is engaged with a sprocket, the audible shock reduction by the elastic deformation of rollers achieves up to 10DB in reduced noise. The sliding noise between the rails and the rollers when used for conveying is also reduced. Available sizes are RC40SLN to 80SLN. Offering a broad product range in many sizes, Daido Corporation of America is one of the leading suppliers of both standard and specialty conveyor chains. Daido’s Priority One Attachment Chain Program is our commitment to our customers to deliver a superior quality attachment chain in three days or less. Additionally, our internal set matched procedures empower us to complete and ship the matched set chains allowing for a few additional days. Available in both carbon and stainless steel, all standard and wide contour attachments are available in a wide range of sizes. 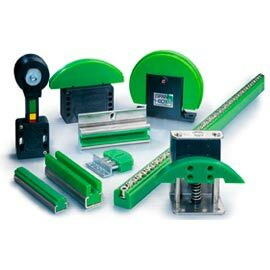 Daido’s 70 plus years of experience in delivering conveyor chains to North American industries also gives us the expertise to custom design and manufacture an attachment required for your application. D.I.D. - The world class quality roller chains that provide additional insurance on the chain drive with the most superior material available and the most advanced quality control system. TRU-PITCH - Daido’s roller chains and accessories which are offered at affordable prices. Daido Corporation is pleased to announce a strategic alliance with Murtfeldt GmbH. This union means that Daido will supply Murtfeldt Guide and Tensioner products to markets in North America. Murtfeldt GmbH of Dortmund, Germany holds worldwide patents for custom plastic parts, fully automatic chain tensioners, a broad range of standard chain and belt guides, and slide profiles. They are the leading manufacturer and supplier in Europe. Murtfeldt’s Chain & Belt Tensioners and Chain & Belt Guides are all produced with the patented Material “S”, a premium UHMW-PE fabrication properties that resist high abrasion and provide a low friction coefficient without the need for lubrication. These products significantly increase the life of the chain and belt drive by eliminating slack and vibration at reduced noise levels.